Updated on Oct. 26, 2017, to reflect this model’s IIHS safety rating. Quality time with the all-new Volkswagen Tiguan. Those of us who review new cars are often flown in by the manufacturer for a media event, allowing us to preview and drive a certain model. Such opportunities make for a good chance to meet company representatives, including engineers, designers, executives, and marketing people. The drive time, however, is usually short, limited to a few hours behind the wheel, and are almost always split with a media partner. While we may be able to formulate a good first impression, they’re still never long enough to develop a thorough review. Happily, manufacturers typically follow up the introductions by adding new vehicles to our media rotation. This means a model similar to what we drove a few weeks or months earlier is bound to appear for a full week of testing. And that’s precisely what happened when a 2018 VW Tiguan arrived at my home as September dawned. The 2018 VW Tiguan is an all-new compact SUV now available in Volkswagen showrooms. You have a choice of four grades: S ($25,195), SE ($28,930), SEL ($32,550), and SEL Premium ($36,250). Add $1,300 for all-wheel drive. Prices do not include the mandatory $900 destination and handling charge. My weekly driver for this review was a 2018 VW Tiguan SE. This front-wheel drive model retails from $28,930 and added $1,200 for the panoramic sunroof package. VW then subtracted $850 because this one wasn’t built with the automaker’s automatic emergency braking package. Thus, the sticker price came in at $30,180. Don’t confuse this Tiguan with the Tiguan Limited, the first-generation model renamed and still in production for the 2017 model year. 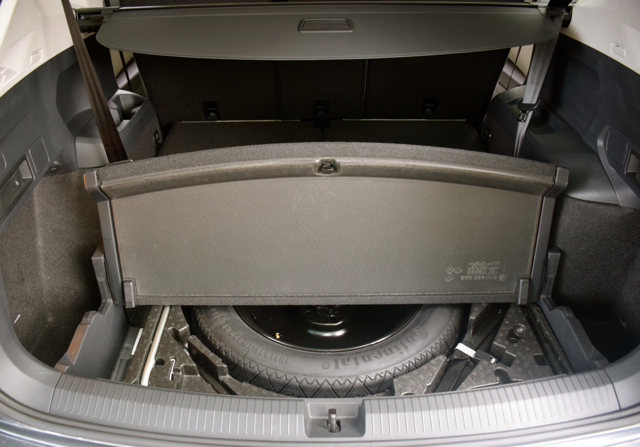 The Tiguan Limited ($21,995) has two package choices: Wheel ($495) and Premium ($1,295). Add $865 for the destination fee. There is no telling how long the original will be around. For the sake of this review, we’ll explore the 2018 Tiguan model in SE grade. Where the first-generation Tiguan was the smallest model in the segment, the second-generation model is now one of the largest. The expanded footprint means not only is the cabin larger, but the overall look moves away from the original’s almost toy-like appearance. The new model is a welcome departure, with a handsome front fascia, character lines running from front to back, and an overall look that is at once elegant and sporty. All models come with power adjustable and heatable side mirrors, roof rails, and LED taillights. Heated washer nozzles, power-folding door mirrors with puddle lights, and a panoramic sunroof are part of a package or come in the upper trim level models. 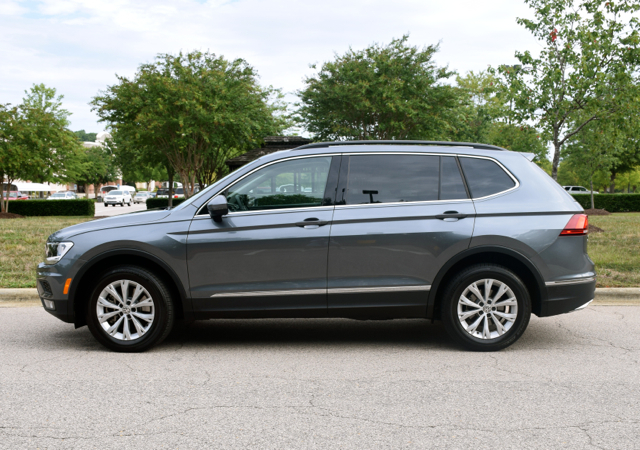 The 2018 Tiguan offers standard aluminum alloy wheels ranging from 17 to 20 inches and set within all-season tires. 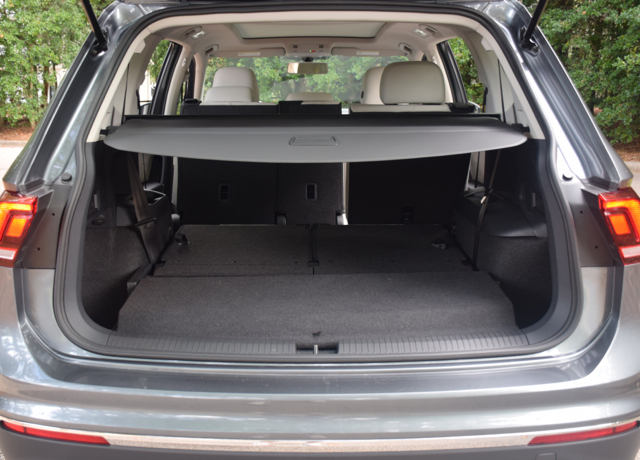 A larger Tiguan means there is more room inside. Volkswagen also takes the unusual approach to add a third row to some models, something only the Nissan Rogue has and the Toyota RAV4 previously offered. That third row, however, comes standard in front-wheel drive models, but is optional in all-wheel drive models (a $500 upgrade). Figure that VW believes AWD shoppers have utility in mind and aren’t especially interested in an extra row. The first two rows are, of course, the roomiest. I found the front seats comfortable and supportive, and the second-row 40:20:40 bench ideal for two or three in a pinch. Getting to the third row means pushing forward and tilting the second-row seat. 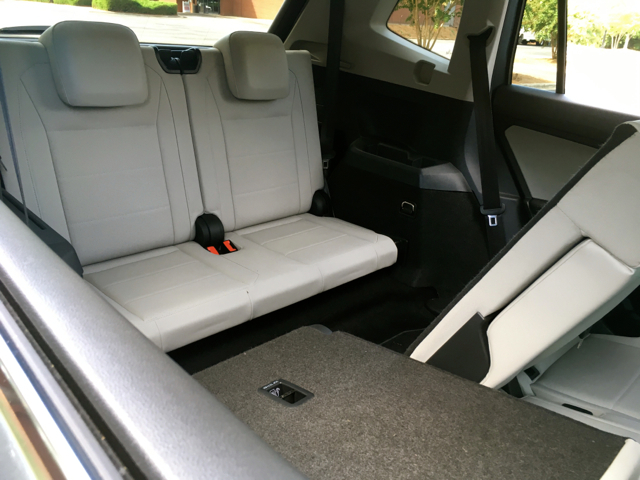 The access point isn’t as wide as found in the larger VW Atlas and once you arrive you’ll find two small seats. 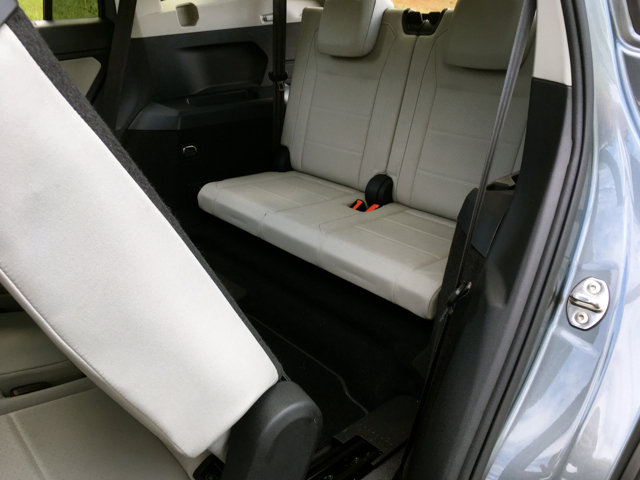 Essentially, they’re jump seats, ideal for preteens, but only for short drives. By no means are they comfortable — support is wanting and padding is thin. 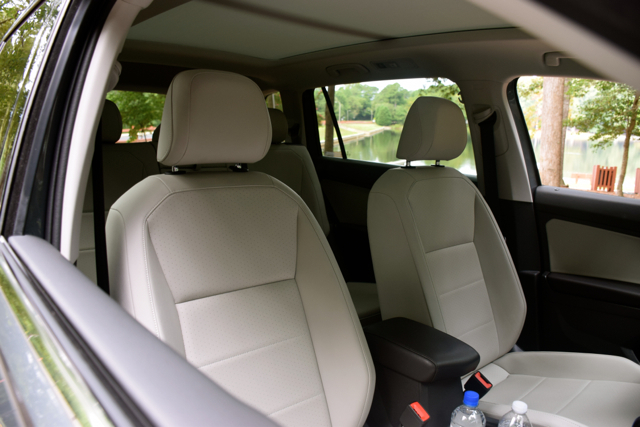 The rest of the Tiguan’s interior matches well with what the competition offers, including the Chevrolet Equinox, Hyundai Tucson, Ford Escape, and Jeep Compass. Soft touch materials, plastics and brightwork trim cover much of the interior. 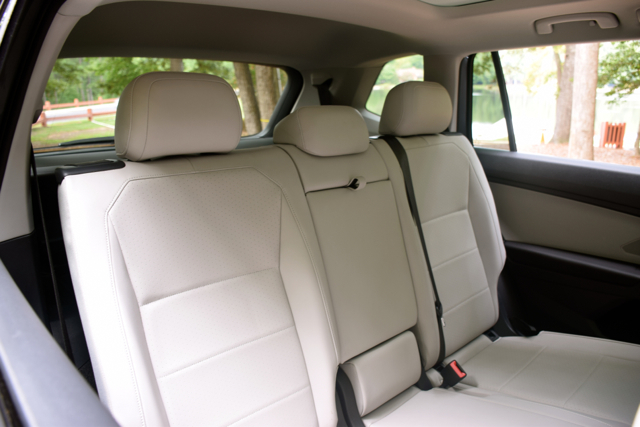 The base model has cloth seats, the two middle grades come in imitation leather, while the top-trim offers real leather. The base model offers minimum trim, including cruise control, a telescoping steering column, air conditioning, and a manually operated driver’s seat. The equipment list is more palatable at the SE level, bringing in keyless entry and push-button start, a leather-wrapped steering wheel, a power driver’s seat, and heated front seats. Other models add dual-zone climate control and a power liftgate. We’re waiting on the safety scores from both Insurance Institute for Highway Safety (IIHS) and the National Highway Traffic Safety Administration (NHTSA). While the previous model didn’t achieve the top ratings, we’re expecting the 2018 Tiguan to show improvement. Beyond the usual anti-lock brakes, stability and disability control, and tire pressure monitoring system, all models have a rearview camera and an intelligent crash response system. Following an accident, this system automatically unlocks doors, activates interior lights, and cuts power to the fuel tank. Forward collision warning with autonomous emergency braking and pedestrian monitoring along with an active blind spot monitor with rear cross-traffic alert comes standard on all trims or is in a package on the base model. Other available features include lane departure warning, park distance control, and high beam control. Standard tech features include a six-speaker audio system, one USB port, Bluetooth connectivity, and a 6.5-inch color touchscreen. Also included is Volkswagen’s Car-Net App-Connect system for compatible devices, providing connectivity for Apple CarPlay and Android Auto. At the SE level, this grade offers an 8-inch color touchscreen with satellite radio and two additional USB ports. An upgraded entertainment system comes with the SEL. 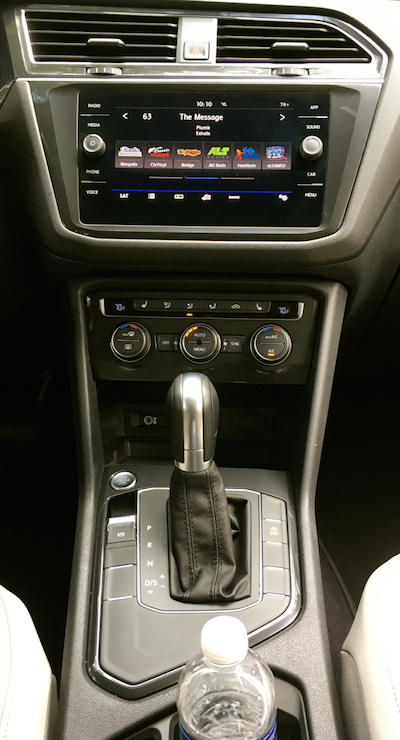 Volkswagen’s infotainment system is fairly straightforward, offering a clear display and an understandable layout. Apple CarPlay connectivity was seamless. Like some competing models — Nissan Rogue, Mazda CX-5, Toyota RAV4 and the Honda CR-V — Nissan offers just one engine choice with the 2018 Tiguan — a 2.0-liter turbocharged four cylinder paired with an 8-speed automatic transmission. 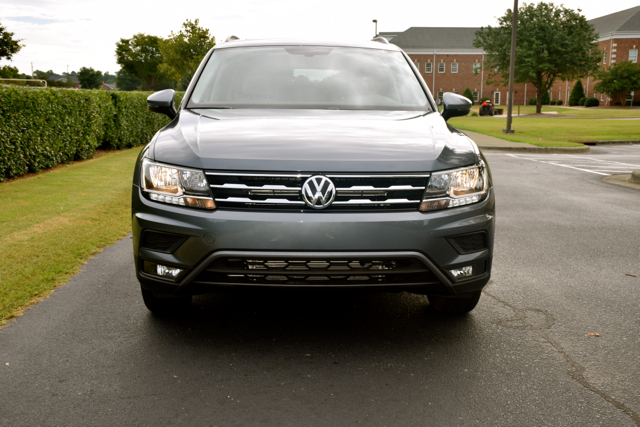 If it sounds familiar to you it should — it is the latest version of the engine that has long powered the Tiguan. 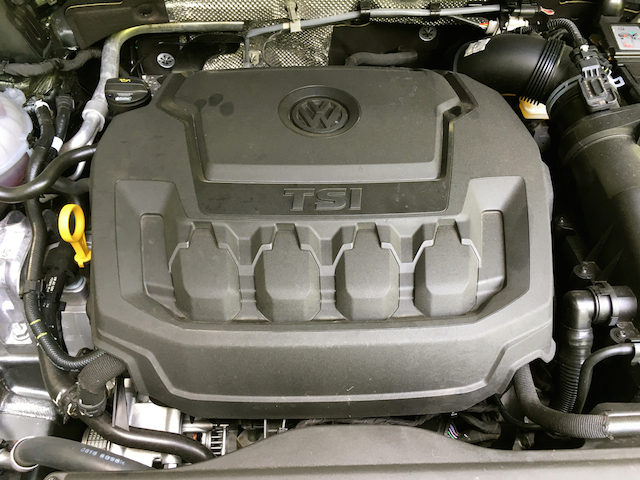 This time, Volkswagen changed the performance settings, as the four banger now makes 184 horsepower and 221 pound-feet of torque compared to 200 horsepower and 207 pound-feet of torque in the previous model. This means you’ll conserve power at the outset, but enjoy greater boost later. 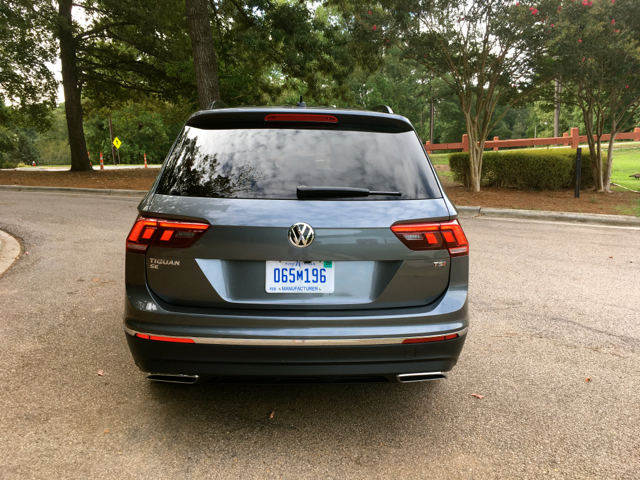 Unlike my first time with the 2018 Tiguan where Colorado mountain ranges beckoned, my drives covered the hilly terrain of central North Carolina. I made sure I had enough twisty roads to cover and I wasn’t disappointed. As before, I found the steering sufficiently weighted, the handling proficient, and the brakes firm. Not once did I feel that there wasn’t enough power available, although I couldn’t help wonder how the engine would perform when four or more people were present and their gear too. 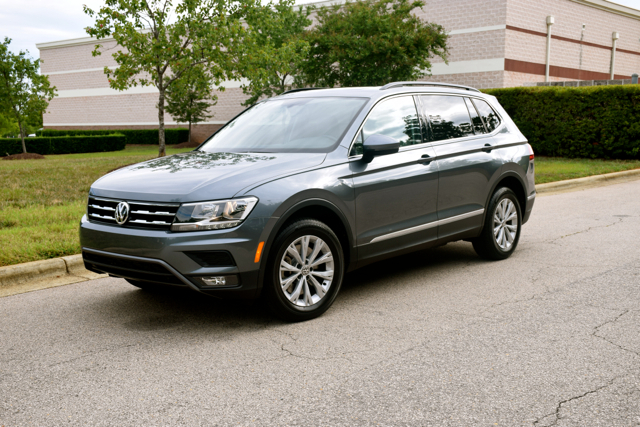 The 2018 Tiguan gives Volkswagen a strong entry in the ultra-competitive small compact SUV segment. It joins the all-new and midsize Atlas, while the Touareg retires after 2017. 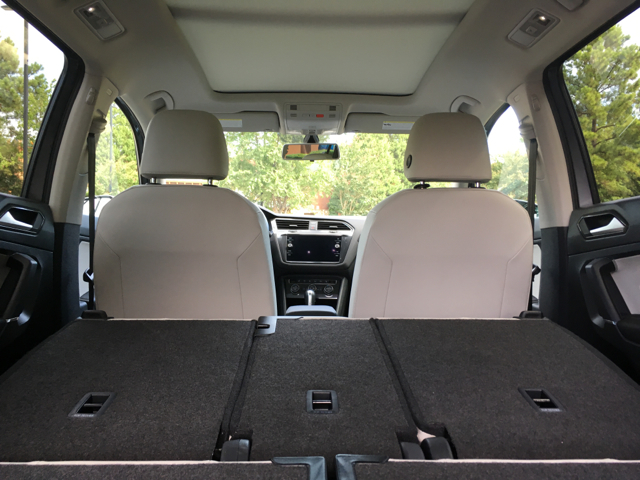 If you’re looking for something smaller the Golf SportWagen and Alltrack have you covered, effectively giving VW a much needed 1-2-3 utility vehicle punch. 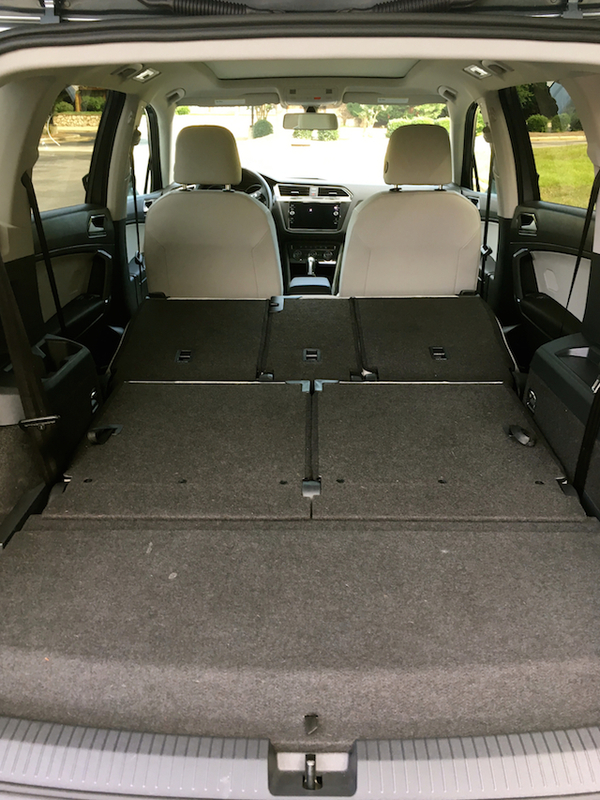 Shop for a 2018 Tiguan and I recommend starting with the SE grade. It offers many of the amenities customers expect along with several driver assist features. I’m glad Volkswagen sent a front-wheel drive model for my review as most people in my area can do without all-wheel drive. With the panoramic sunroof upgrade, expect your SE FWD model to come in just under $30,000.